Modern business requires a reliable and secure storage solution to back up, protect, and manage data effectively. 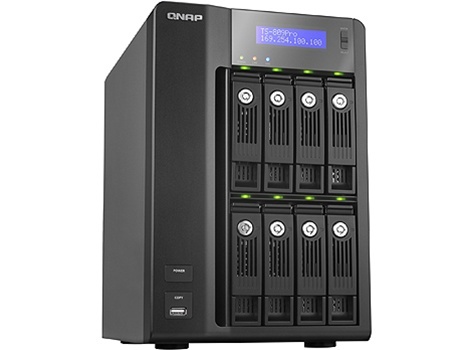 The TS-809 Pro is the powerful 8-bay high-volume member of QNAP's award-winning Turbo NAS family designed for business users. It is a NAS of class-leading performance, supports advanced RAID configurations for data protection, built-in iSCSI target service, AES 256-bit volume-based encryption, lots of enterprise-grade server features, and delivers high reliability for multiple concurrent applications. 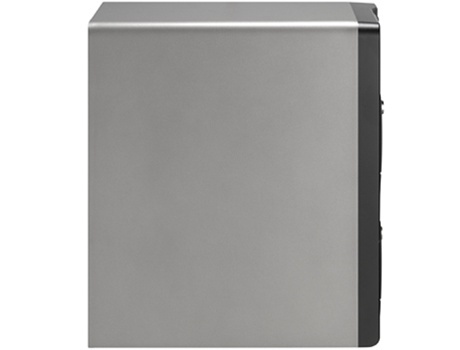 The TS-809 Pro is featured with Intel Core 2 Duo 2.4GHz CPU and 2GB DDRII memory. It supports RAID 0/ 1/ 5/ 6/ 5+Spare, JBOD, Online RAID Capacity Expansion, and Online RAID Level Migration. The TS-809 Pro can serve as a NAS and an iSCSI target server. The built-in iSCSI target feature provides an affordable IP-SAN (Storage Area Network) alternative for SMB. You can set up the NAS to expand the storage capacity for existing application servers, such as database server and mail server in an economic way. Moreover, the "Virtual Space Allocation" (Thin Provisioning) feature is provided which allows you to flexibly allocate the capacity of iSCSI LUN (Logical Unit Number) at the beginning regardless of the physical volume capacity. 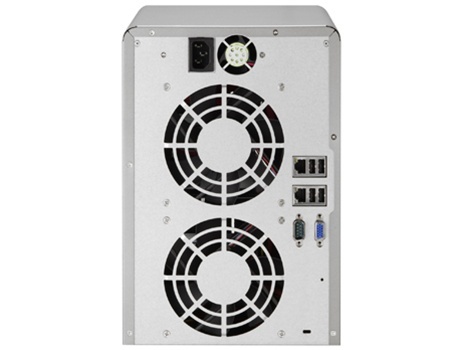 The TS-809 Pro supports file sharing across Linux, UNIX, Mac, and Windows platforms. Versatile business are supported, e.g. 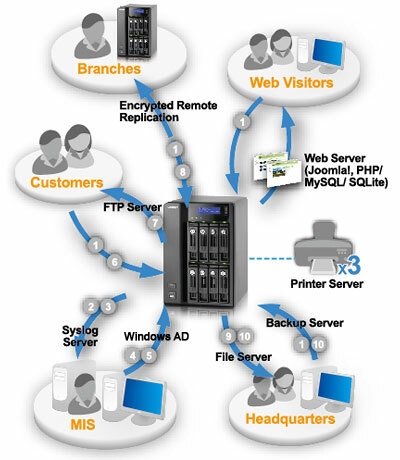 file server, FTP server with encryption, and printer server, PHP/MySQL supported web server, and encrypted remote replication . Also, Windows AD (Active Directory) is supported to help create an easy-to-access environment and lower the maintenance cost. SSH login and web page SSL login enable you to transfer, store, and share data securely. 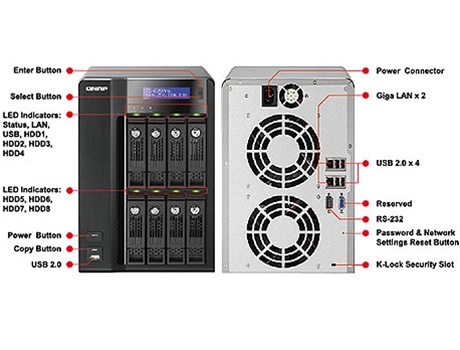 The TS-809 Pro's dominant "volume-based encryption" feature secures the server data by AES 256-bit encryption. Even if the hard drives were stolen, there is no need to fear that the confidential data would be leaked since the data can only be accessed by an authorized password. 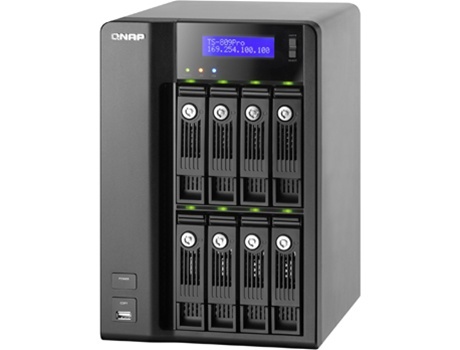 The handy LCD display on the NAS provides a speedy and easy approach to initialize the NAS and set up the RAID configuration without using any computer. The system information and settings are also displayed for easy management. The schedule power on/off feature is available on the NAS for you to flexibly manage the NAS server's up time according to the working hours. Also, the smart Wake on LAN is supported for convenient remote wakeup of the NAS in the local network. The dual LAN ports can be configured as failover which allows the NAS server to sustain the failure of one network port to provide continuous services. The two LAN ports of the NAS can be configured as load balancing mode for bandwidth aggregation to boost the file transfer speed (works with managed Ethernet switch with 802.3ad configured). The NAS can be deployed with two IP settings for sharing among different workgroups in two different subnets. All the OS and applications are embedded on the DOM. The NAS allows system booting without accessing the physical disk sectors and that avoids unsuccessful system startup caused by bad block sectors or file errors on the hard drives. Two operating systems are built on the DOM for system booting alternatively upon every system startup. When one fails, the other one will be used to boot up instead, and the failed OS is recoverable from the other healthy OS. The NAS offers advanced RAID 0, 1, 5, 6, 5 + Spare, Single, and JBOD disk configurations. It also supports hot-swap design that a failed drive can be replaced by hot swapping without turning off the server. Besides, the best-in-class RAID on the NAS brings users a higher level of data security by allowing one more hard drive failure than other NAS of the same level. You can upgrade the disk configuration to higher RAID level with the data retained. There is no need to turn off the server during the process. The unique "Virtual Disk Drive" adds flexibility to expand the capacity of NAS. By using the built-in iSCSI initiator, the NAS can connect to other iSCSI targets on the network and turn them into virtual disks, which become multiple single volumes on the NAS. Up to 8 virtual disks can be stacked. The NAS serves as the storage stack chaining master. 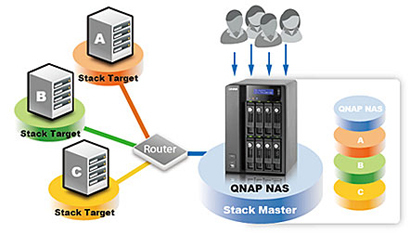 The user only needs to connect to this single entry (QNAP NAS) and is able to reach and use all the iSCSI target storages on the network. 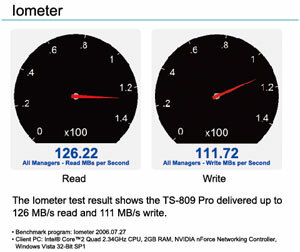 The TS-809 Pro can act as a NAS and iSCSI target server at the same time. It provides a cost-efficient iSCSI solution to set up an IP-SAN. You can make use of the built-in iSCSI target service to add up to 8 iSCSI devices. Different iSCSI Target LUNs (Logical Unit Number) can be defined as storage expansion or backup destination of the existing application servers, such as database servers and mail servers. Furthermore, the "Virtual Space Allocation" (Thin Provisioning) feature is provided which allows you to flexibly allocate the capacity of iSCSI LUN (Logical Unit Number) at the beginning stage without the limitation of the volume space. When the physical storage capacity of the volume is going to be full, the server manager can easily expand the storage capacity by "Online RAID Capacity Expansion", or adjust/ remove the current unused volume space according to the demands. The NAS supports Hard Disk Drive S.M.A.R.T. (Self-Monitoring Analysis and Reporting Technology) for monitoring the hard drive status. Moreover, the NAS is embedded with HHS Technology which supports disk checking and bad blocks scanning. The NAS supports the majority of USB UPS devices (usbhid-ups supported) which enables the users to store the data in time and avoid critical data loss when power outage occurs during data transfer. It also supports advanced stand-by mode setting that users can set the time for the server to enter standby mode when an abnormal AC power supply is detected. When the power resumes, the server resumes to the operation status before the power outage. You can use the handy LCD to finish the first time installation in 3 simple steps. 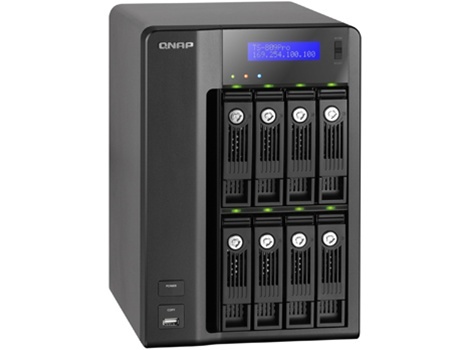 The NAS will automatically complete the hard disk formatting and RAID building. The NAS is designed for users to share the files across Windows, Mac, Linux, and UNIX environment. The Windows AD feature enables you to import the user accounts from AD domain to the NAS to reduce the time and effort for account setup, and the users can use the same set of login name and password. The NAS provides Web File Manager for you to easily download, upload, and manage the files on the server by web browser. The NAS supports batch creation of users and share folders to save the time and effort of the server manager in account and folder creation. For the security of Windows network environment, server managers can hide or show network share folders. You can configure the hard disks to enter standby mode if there is no disk access within the specified period. The flexible schedule power on/off feature is now provided on the NAS for you to manage the NAS server's up time according to the working hours. You can set the time for automatic system power on, power off, or restart on any days of the week. The backup software, NetBak Replicator, is provided for the NAS users to perform real-time synchronization or schedule backup from multiple PCs to the NAS. The NAS works well with other backup software, e.g. Acronis True Image, CA BrightStor ARCserve Backup, EMC Retrospect, Symantec Backup Exec, and LaCie Silverkeeper. The data on the NAS can be backed up to or from another Turbo NAS or Rsync server over the network. The one touch button can be configured to trigger instant data backup from the external USB device to the NAS or the other way round (applies to the USB device connected to the front USB port of the NAS only). Comprehensive event logs: Detailed logs of file-level data access to the NAS via samba, FTP, AFP, HTTP, HTTPS, Telnet, and SSH, and networking services accessed by online users are all recorded. IP filter control: The server manager can allow or deny specified IP connections to the NAS. SSL security (HTTPS): The NAS can be accessed and configured by web browser securely. Remote login to the NAS by SSH (secure shell) or Telnet connection is supported. Secure FTP: The data can be transmitted with SSL/TLS (explicit) encryption. Passive FTP port range setup is also supported. Write-only access right on FTP server: The third party partners are allowed to upload data to the NAS but not able to read or edit the data on FTP server. To prevent the NAS from malicious attacks, you can create an IP filter policy to allow, deny, or auto-block the IP address or network domain which attempts to connect to the NAS via SSH/ Telnet/ HTTP(S)/ FTP/ samba/ AFP. 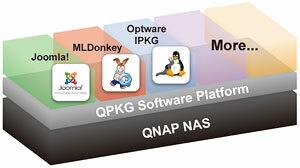 The QPKG software package platform enables the users to maximize the usage of the NAS by installing additional software packages developed from the users and community worldwide. This can be done by simple "download & install" clicking without going through any complicated process. With the built-in phpMyAdmin, Joomla!, editable php.ini, MySQL and SQLite, you can easily set up your web server and other online applications such as online shops and forums. 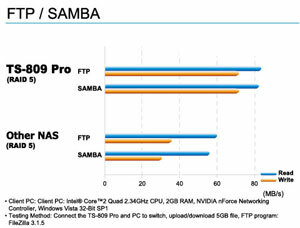 The NAS is the most affordable choice as a standalone database server for system integrators. It can be flexibly applied in various deployments such as a database server of another web server in remote site or as an additional backup database server. The NAS supports dynamic DNS (DDNS). You can register a unique domain name from a DDNS service provider and assign it to your NAS. There is no more need to remember a lengthy IP address! The Surveillance Station enables users to configure and connect 4 IP cameras simultaneously and remotely manage the functions, including real time monitoring, recording, and playback by IE browser over the Internet. Users can flexibly define the recording settings: continuous recording, motion-detection recording, and schedule recording according to their security plan. All the files are stored in AVI format with time stamp, users can easily search and play the files by Windows Media Player. The Surveillance Station of QNAP NAS supports the leading network camera brands such as AXIS, D-Link, IPUX, LevelOne, Linksys, Panasonic and Vivotek etc. By using particular models, users can use two-way video and audio monitoring and recording, and smart PTZ control to control the monitoring direction via the web interface. Enable this option to power on the NAS remotely by Wake on LAN. Wake on LAN helps you manage your NAS conveniently. The fan rotation speed is automatically adjusted according to the server's temperature. You can also define the system temperatures to trigger high speed or low speed rotation of the fan. By manually setting the fan rotation speed, the fan will rotate at the defined speed continuously. You can configure the SMTP server and SMSC server settings on the NAS in order to receive instant system warning or error messages by email or SMS. You can upload a secure certificate and an RSA private key in X.509PEM format issued by a trusted provider in order to allow the users to access the NAS by secure SSL login. All the system event logs and connection logs can be saved to a remote syslog server. The files deleted from the network shares of the NAS will be moved to a particular recycle bin folder. You can restore your data anytime in case of unintended file deletion. The logs of connections to the NAS via samba, FTP, AFP, HTTP, HTTPS, Telnet, and SSH, and networking services accessed by the online users are all recorded. You can view the system status, e.g., CPU usage, total memory, free memory, packets received, packets sent, error packets, system up time, CPU temperature, system temperature, HDD temperature, and system fan speed. The TS-809 Pro supports five USB 2.0 ports. The users can connect the external storage devices to the NAS for server data backup or expanding the capacity of the server. The QPKG software package platform enables the users to maximize the usage of Turbo NAS by installing additional software packages developed by the users and community worldwide. This can be done by simple "download & install" clicking without going through any complicated process. MLDonkey (eMule) MLDonkey (eMule) is a door to the "donkey" network, a decentralized network used to exchange big files on the Internet and present most features of the basic Windows donkey client (e.g., eMule). Slim Server on Turbo Station (with SqueezeCenter 7) Squeeze Center is the server software from Slim Device that manages common digital audio formats (.mp3, .flac, .ogg, etc.) and streams them to its players. Slim Server On Turbo Station (SSOTS) developed by flipflip is an add-on to the Turbo Station's firmware which provides the environment to run Squeeze Center 7 on it. Optware Ipkg (Itsy Package Management System) Ipkg, or the Itsy Package Management System, is a lightweight package management system designed for embedded devices. It is used in the Unslung operating system for the Linksys NSLU2, in OpenWRT, OpenMoko, Gumstix, iPAQ and now on QNAP NAS too. Python Python is a general-purpose, high-level programming language. Its design philosophy emphasizes programmer productivity and code readability. WordPress WordPress is a free, open-source personal publishing system that allows you to easily create a complex blog, or web log, on your site. Written in PHP and supported by a MySQL database, WordPress offers intuitive administrative tools and sophisticated design features that make it easy to develop and integrate a personal or professional blog on your site. Joomla Joomla! is a free, open source content management system for publishing content on the world wide web and intranets. The system includes features such as page caching to improve performance, RSS feeds, printable versions of pages, news flashes, blogs, polls, website searching, and language internationalization. phpMyAdmin phpMyAdmin is an open source tool written in PHP intended to handle the administration of MySQL over the Internet. Currently it can create and drop databases, create/drop/alter tables, delete/edit/add fields, execute any SQL statement, and manage keys on fields. Xdove XDove named after XMail & Dovecot the 2 open source offerings that are combined to provide a complete set of Email server functionalities which is one-click installable on your QNAP NAS. XDove not only provides SMTP, POP3 and IMAP services, it also comes with a variety of features like multiple virtual domains and accounts, AJAX webmail with extended functionalities including personal folders, address book, calendar and real-time chat among users under the same mail domain. Besides the mail services XDove offers scheduled backup and restore of your mailboxes from multiple domains which gives you an extra protection on the top of your RAID data redundancy. AjaXplorer AjaXplorer is a file explorer for remotely managing files on a web server or operation as a simple file-sharing system. Its rich layout and actions make it easily accessible to virtually any end-user. The AJAX based interface, providing streamlined and intuitive functionalities, similar to that of a standard file-system explorer on any operating system. Multimedia Station Image slide show and rotation (+90? -90? Display photo details: dates, exposure time, aperture, etc. 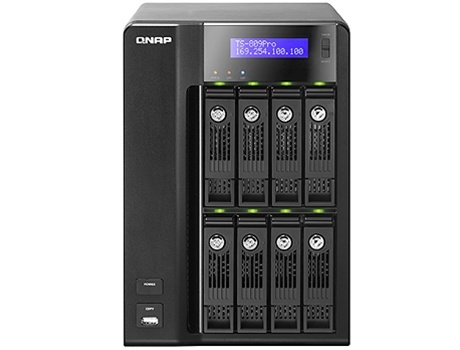 QNAP remote download control software: QGet (Windows/ Mac), allows you to control the download tasks of multiple NAS servers on one PC via LAN/ WAN. When the system is ready, users can check or configure the IP settings, physical disk info, volume info, system info, shut down or reboot the NAS, etc.